I'd already made fruit pies and savory pies, so it was time to try something new. I chose the delicious-sounding grasshopper pie, which I'd never had before — though I do love me a grasshopper drink, which is comprised of creme de menthe, creme de cacao, and cream. 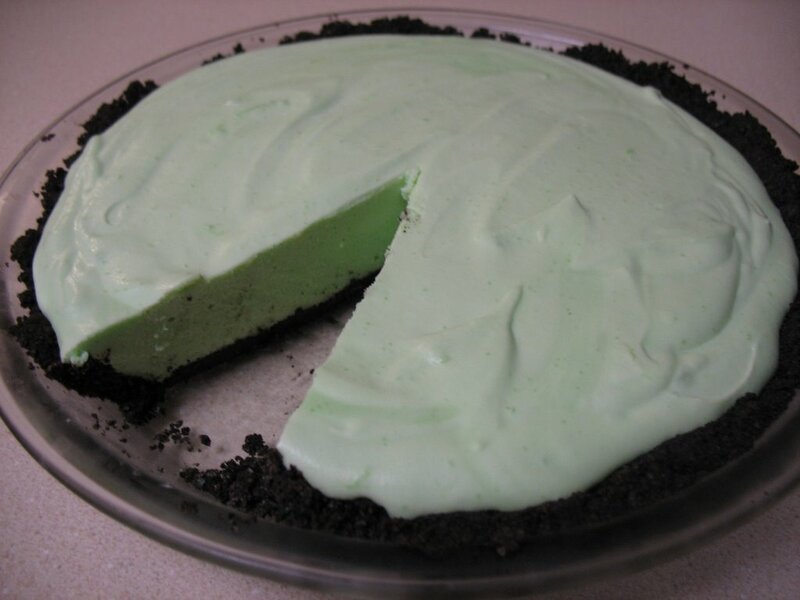 The pie is basically the same thing, with the addition of a crust made from pulverized mint Oreos. It's definitely not a pie for the kids, since the alcohol doesn't get cooked off, and, in fact, you can still taste it faintly behind the strong chocolate-peppermint flavors. Oh, and there's also gelatin in there, so it's not so good for strict vegetarians, but it made the texture very interesting: creamy, smooth, with a slight bounce reminiscent of Jello. Recipe to come shortly, as well as the previously promised complete pie post, once I get this paper written. We went out for pie on pi day proper, but celebrated this weekend with storebought cherry and apple caramel pies, a homemade "dessert pizza", and a huge brownie with the letter pi in mint chips on top. Yum! No rolling out the dough and having to worry about how it'll turn out? I can just go someplace and the pie is already made? After all the pie baking I've done over the last couple months, storebought pie sounds really good!